After years of isolation, Myanmar opened up to the global economy in 2010, and its banking sector sprung to life. Consequently, foreign direct investments started to flow, particularly towards the telecommunications sector. Myanmar’s mobile phone penetration, once at one of the lowest levels in the world, has grown to 90 percent in recent years, with smartphone ownership rising to 80 percent. This trend has boosted digital evolution, transforming the financial service environment in Myanmar, both online and offline. In recent years, more ATMs have been installed, more credit cards have been issued and new, modern bank branches have been built. Since its foundation in 1992, CB Bank has been at the forefront of the financial market’s digitalisation. In 2011, the bank introduced the country’s first ATM service. In the following year, it once again acted as a pioneer, implementing the first core banking system in Myanmar, which has since allowed the bank to introduce new products in the market. What’s more, this has paved the way for further innovation. CB Bank provides its customers with mobile banking services, both for individuals and businesses. Through the mobile banking app, the former can access 60 different services, including basic banking functions and mobile phone top-ups. They can also make money transfers inside the country with just a valid national identification card and a mobile phone number. Internet banking allows CB Bank’s corporate clients to access financial services remotely, meaning their needs are met without the need to travel to branch offices. They largely relate to everyday operations, allowing companies to make payments to vendors and counterparts, administer payroll for employees, send trade documents and employ foreign exchange services, among other facilities. CB Bank has also worked with large corporations to integrate their enterprise resource planning systems with the bank’s core banking system. This has enabled corporate clients to automate their financial transactions and payment process flows with the bank. 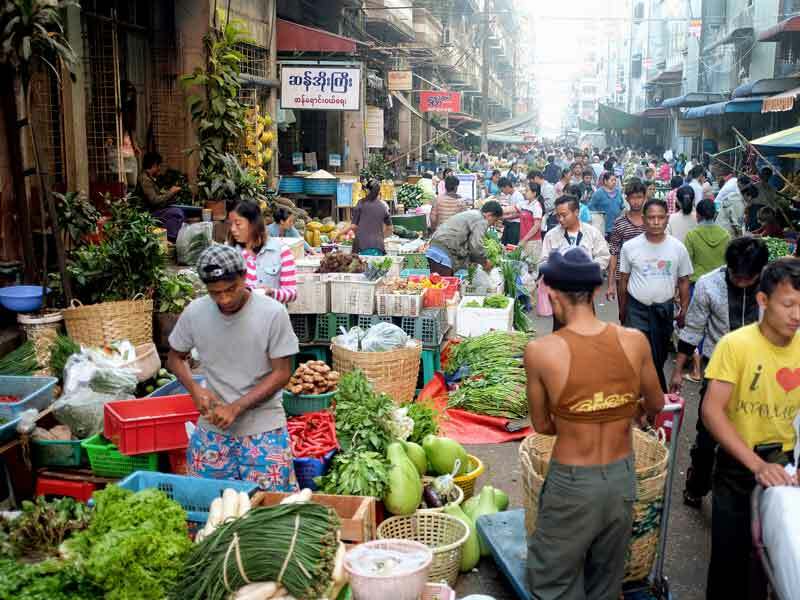 Despite all of the steps made towards digitalisation, Myanmar is still a cash-based society. “This is why we have implemented automatic banking machines such as ATMs, cash deposit and withdrawals machines, and cheque deposit machines, along with foreign exchange terminals, to buy and sell foreign currency notes,” added Thein Zaw Tun. CB Bank’s automatic cash services are available 24/7. The outcome of this widely expanded technology infrastructure is that, today, 40 percent of the bank’s total transactions are digital. That said, the journey towards the country’s complete transformation is taking time for several good reasons, according to Thein Zaw Tun. The second reason is, as mentioned previously, the traditionally high use of cash. But there’s another cause: the banking sector in Myanmar has a difficult history, which has undermined the confidence in the system. Rebuilding trust in the banking industry is not possible overnight. For that reason, the adoption of modern tools like digital transactions is expected to take longer as customers are still cautious about the security of the digital environment. “In the transition, therefore, we need to find the balance between the digital presence, mainly in payments, and the physical presence, based on cash points for digital financial services,” said Thein Zaw Tun. Given the size of the country, digital banking represents a huge opportunity for financial inclusion. With 55 million consumers, banks are limited in their reach to people and businesses across the territory. Time and strong investments would be needed to expand in the traditional way. Digital tools, however, can be a catalyst for development. Anyone who has a mobile phone can now send and receive money. Another banking channel aimed at accelerating the pace is the mobile agent banking network, a service introduced to CB Bank’s mobile platform in 2014 to bring financial services to rural areas not covered by bank branches. “Our agent banking network covers rural areas and carries out basic banking transactions in places where there are no bank branches,” said Thein Zaw Tun. Moreover, the bank recently partnered with Myanmar’s post offices to introduce mobile banking agents throughout the country, a move that is expected to further support the country’s efforts to boost financial inclusion. In addition, the bank has opened accounts with Grab and Uber, providing mobile banking services and issuing ATM cards to thousands of taxi drivers in Yangon. The concept of inclusion is also valid for small and medium enterprises (SMEs), with many of them now using mobile banking facilities. Furthermore, the bank is the largest acquirer and issuer of card payments through POS terminals in Myanmar – merchants being their main users, in addition to SMEs. “The SMEs have a working relationship with our large corporate clients, with whom we have direct system integration, so that financial processes can be automated and executed on a real-time basis. In this way, we have built a digital banking ecosystem,” Thein Zaw Tun said. All of these initiatives show how CB Bank is contributing to the development of the digital economy, a process that starts by listening to customers and delivering solutions to them, especially in relation to digital payments. Before the country was integrated into the global economy, the bank was functioning as a retail bank without a team dedicated to supporting large corporations. At the time, no one had ever heard of digital banking in Myanmar. But after 2010, a growing number of foreign corporations entered the country, while local companies crossed the border to expand their reach. “This has shaped our services, particularly as we continue to learn from our partner banks in other countries in terms of how they serve their corporate clients. This is how we started a technology-based cash management service for our multinational clients,” explained Thein Zaw Tun. For the bank, which now offers cash management services to foreign bank branches in Myanmar, the journey has been as challenging as it has been rewarding. Throughout this revolution, Millennials have been the catalyst for change. This generation, which grew up in a connected environment with mobile phones and social media serving as their main communication tools, largely refrains from visiting bank branches and prefers digital banking for transactions. “Today’s youth, the so-called Generation Y, demands basic financial products like credit cards and loans to support their lifestyle. Banks are therefore being challenged to design products and services to meet their needs: simple to understand and user-friendly,” said Thein Zaw Tun. That said, Millennials are but one group of potential clients in the market. Today, banks in Myanmar are growing from a very low base, as less than 10 percent of the population has access to formal banking services. This sets particular game rules in the local market, where banks are no longer just competing with other banks; they are also competing with tech firms such as telecoms providers, as well as fintech start-ups. Amid this increasingly digitalised environment, banks face further changes and challenges as they continue to add value for their customers. Meeting new requirements means moving to an agile and omnichannel model, in which services are in easy reach of any client, in the real or the cyber world. CB Bank is fast approaching this new world, conscious that customers need banking, not just banks.